I am in the middle of making holiday cards for Send a Smile 4 Kids. Yes, it's crunch time for holiday card making! This card that I saw on Pinterest inspired the design for my card today. That one has only one candy cane, but I felt my design called for 2. I'm not sure if the other card maker used a larger circle punch or die than I did, but I thought having just one of the candy canes I made on my card left too much bare space. I began by punching the circles for my candy canes. I used a 3/4" circle punch, and punched 10 red circles and 9 white for each cane. It really wasn't that bad time-wise, since I was punching instead of having to run the cardstock through with a circle die 38 times for both canes! Once I had punched them all, I used liquid glue to glue them all together. I followed the design of the inspiration card closely, so I could get the curve at the top correct. For the background, I die cut a kraft panel with the largest of Memory Box's "Wrapped Stitch Rectangles." I laid my candy canes centered on the panel so I could get a sense of where to attach them together. I tacked them together with a dollop of liquid glue, though without gluing them to the panel just yet. (I just wanted to be able to move them as one unit.) Then I set those aside to dry. I stamped a greeting from Hero Arts' "Color Layering Wreath" set in Versamark onto a scrap of red cardstock, and heat embossed with Ranger Super Fine Detail White embossing powder. I die cut that with the oval from the "Stitched Tags" set by Pretty Pink Posh (apparently discontinued). I didn't want the greeting just "hanging out" on my card, so I cut two 3/8" long slits on either end of the oval with my craft knife. I threaded some red & white checked ribbon through the slits, going under the tag. I adhered the ends of the ribbon to the back of my panel. By this time, my candy canes were dry. I glued them to my panel, centered & towards the top. Finally, I tied a bow with the same ribbon as I'd used under the greeting, and adhered that over my candy canes with a glue dot. I did squirt some more liquid glue under the top of the knot, just to make sure the bow didn't come untied. I mounted my panel to a white A2 card base, & this was done! It was so easy, I actually made 2 at the same time. Both took me only a couple of hours total to make, including figuring out how to put together the candy cane. Dies R Us Challenge #108: "Stitched Dies"
I created this card inspired by the Wednesday Sketch Challenge #408 at My Favorite Things' blog. I used the penguin from Lawn Fawn's "Winter Penguin" stamp set, and Simon Says Stamp's "Christmas" set for my greeting. In addition to the sketch, I also took inspiration from this card I found via Pinterest. I liked the ornament look, & decided it went perfectly with this sketch! I stamped the penguin onto a scrap of Strathmore Vellum Bristol paper that I'd die cut with a circle die. This paper is my new love for colored pencils, as it has just enough tooth to hold the pigment, without being too textured. I used Memento Tuxedo Black ink for the penguin. Then I masked him off and stamped the ice floe from Mama Elephant's "Arctic Penguins" set. By masking, it makes it look like he is on top of the ice. I colored the image with my Prismacolor colored pencils, adding shading to the ice with a bright teal pencil. I finished the image off by adding some clear Spectrum Noir Sparkle pen to the ice. I also inked around the perimeter of the circle with Tumbled Glass Distress ink, just to provide some definition. For the greeting, I die cut a faux tape strip from more bristol with a die from My Favorite Things' "Blueprints 13" set (discontinued). I had to do a little partial die cutting, to shorten the resulting die cut. I cut apart the "Merry & Bright" stamp from the "Christmas" set, so I had just the "Merry." Then I lined up that and the "Christmas" stamp from the same set, and stamped them together on the strip, double-stamping with Hero Arts Soft Granite ink. I inked around the strip with Tumbled Glass, to tie it in with the ornament ball. I cut a piece of patterned paper with the stitched rectangle die from "Blueprints 15" (discontinued). I then positioned one of the "Stitched Scallop Basic Edges" dies (also My Favorite Things) centered at the top of the panel. After running that through my die cutting machine, I repeated the process to cut the bottom edge. For the "ornament" topper, I die cut a piece of silver glitter cardstock with a die from "Blueprints 13." I cut off just a small portion, and glued it to the back of my circle die cut, letting about 1/2" peek out above the top of the circle. I taped some grey baker's twine to the back of the topper with Scor Tape. 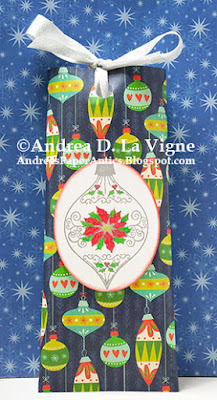 I then popped the whole ornament up on my patterned paper with foam tape. I ran the twine up the panel and over the top, then taped the other end on the back. I adhered my patterned paper to an A2-size panel of dark green cardstock. I adhered the greeting strip with foam tape on the ends, and glued flat to the bottom of the ornament. Finally I mounted the finished card panel to a white card base, and glued on a bow tied from more baker's twine. Christmas Card Throwdown's October Technique Challenge: "Masking"
I created this card based on the sketch from Catch the Bug Challenge Blog's "Stella Says Sketch #617" challenge. I rotated the sketch 90 degrees, to create a landscape card. 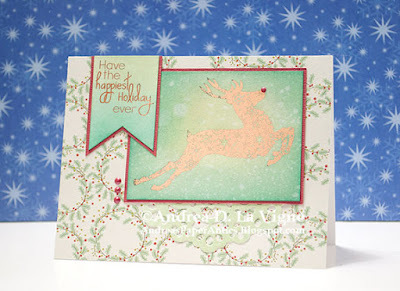 I used the "Snowflake Reindeer Silhouette" from Bugaboo Stamps and a greeting from Doodle Pantry's "Holiday Greetings" digital set. I began by opening the reindeer & greeting images in Photoshop. I created a "mock-up" of the sketch using a blank A2 size landscape-oriented canvas. I sized my reindeer & greeting to fit, and printed them on 2 pieces of Strathmore Smooth Bristol paper with my laser printer. I then foiled each with Heidi Swapp Rose Gold foil and my mini Minc machine. I inked the reindeer with Bundled Sage Distress ink in the middle of the panel, and Evergreen Bough Distress ink around the edges. (I wanted a glowing effect behind & around the reindeer.) After cutting the greeting panel into a banner shape, I also inked it with Bundled Sage & Evergreen Bough to create an ombre look. For the circular shape peeking out from behind the focal panel, I die cut a doily from more bristol paper with the Lifestyle Crafts "Floral Doily" die (discontinued). I inked it with Bundled Sage. After matting my focal panel with red cardstock, I glued the doily to the back. I cut a piece of patterned paper from the "Cozy Christmas" 6x6" pad by My Mind's Eye to A2 size. I adhered that to a white card base. I added my focal panel/doily, making sure to have a fairly even spacing above & below. Finally, I matted my greeting banner with the same red cardstock, and glued it in place. I made 4 dots with Autumn Red Nuvo Crystal Drops on a scrap of freezer paper. When they dried, I popped them off and glued one to the reindeer's nose, & the other 3 beside the focal panel. I'm also entering this card in 613 Avenue Create's Challenge #214: "Anything Goes" (not playing the twist). The current Fusion challenge is "Pastel Halloween." Since I have no more need for Halloween cards now, I decided to use the sketch (flipped horizontally) and colors in the inspiration photo for a Christmas card. I began by stamping my ornaments. I used Sunny Studio's "Holiday Style" set. The layering images in this set are amazing! They just give such a realistic look. I decided to have 5 ornaments, since odd numbers are generally more pleasing to the eye. I used Memento Angel Pink, Altenew Frosty Pink; Memento New Sprout, Altenew Frayed Leaf; and Hero Arts Soft Pool & Tumbled Glass Distress Oxide inks for my ornaments. I also pulled in some Delicata Silvery Shimmer for the toppers. After I die cut all the pieces, I glued each topper to an ornament. I used Lawn Fawn's "Winter Penguin" stamp set for my greeting. I positioned my ornaments on my green panel temporarily, tacking them down with painter's tape. 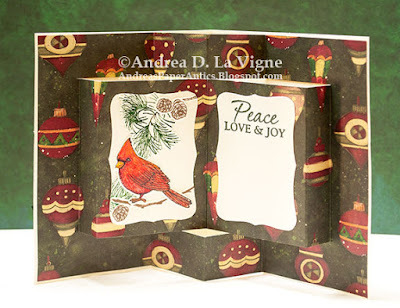 I placed the panel in my MISTI stamp positioning tool, and stamped the greeting with Versamark ink. I actually did each word separately, so I could snug them together more. I heat embossed the greeting with Ranger Super Fine Detail White embossing powder. After that had cooled, I went ahead & glued down my ornaments. I felt the panel had too much white space (something I always struggle with), so I decided to die cut the upper left corner with the "A2 Curved Edge" die (discontinued) from Simon Says Stamp. I used a scrap of patterned paper as a guide for where to cut. I also die cut a strip of silver glitter cardstock with the same die, and positioned it under the green, so it peeks out about 1/8". I adhered my patterned paper to the upper left corner of a white A2 card base, and mounted my card front over that. I'm also entering this card in 613 Avenue Create's "Anything Goes" challenge. The current challenge at Christmas Card Throwdown is to use silver on a holiday card. I decided to go all out, and use lots of silver on my card. It does make it hard to photograph, but it is really beautiful in real life! I die cut the "Poinsettia Border" by Memory Box from some silver mirror cardstock. I had a little trouble with the design after this point, because the die cut is just shy of 5.5" long, but narrow. I finally decided to cut a panel of light blue cardstock to 3.75x5.5", to accommodate the die cut & my greeting. I had applied Stick It adhesive to the back of my silver cardstock before die cutting, so it was just a case of pop out the die cut and adhere it to my panel. Granted, some of the interior petal pieces came out on their own, and I had to set them aside to stick in when I'd adhered the rest of the die cut. But it wasn't too bad overall. After I had adhered my die cut, I put the panel in my MISTI stamp positioner tool. I lined up the greeting, from Hero Arts' "Joy to the World" stamp set, so it sat in the crook between 2 of the flowers. I stamped it in Versamark ink, and heat embossed with Ranger Silver embossing powder. I decided at that point that the upper left area looked really blank. I have a problem with leaving open "white" space, but I wasn't sure what to put there. I finally die cut a bit of the "Poinsettia Border" from more silver cardstock, and adhered it in the corner. Then the design looked unbalanced, so I die cut another bit and adhered it in the bottom left corner. That just seemed to help the flow a bit, and I'm happy now! I cut 2 narrow strips of navy cardstock, and adhered them to a white A2 size card base. I left about a 3/16" border on either side. Finally, I adhered my main panel in place. I really like how this card came out--well worth the struggle with the design! The current challenge theme for Lawn Fawnatics is "Awesome Autumn." I recently got the Lawn Fawn "Pick of the Patch" stamp set & coordinating dies, and have been dying to play with them! I figured this challenge was the perfect opportunity. I used Sketch #SC707 from Splitcoaststampers.com, flipped vertically, as a jumping off point for my design. 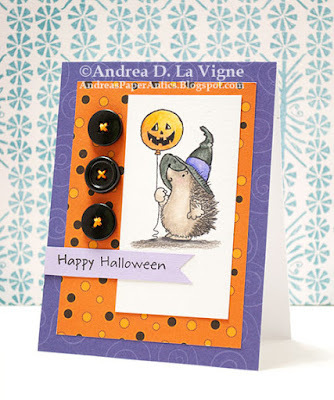 I thought the little images from "Pick of the Patch" would be perfect for a little Halloween scene, using the "Stitched Film Strip" die from Pretty Pink Posh. I first adhered a piece of green cardstock to fun foam with Stick It adhesive. I also added Stick It to the back of the foam. I ran that through my die cut machine with the filmstrip die. I popped out the inner pieces, and laid the die cut on a piece of Strathmore Smooth Bristol paper that I'd cut to fit behind it. I lightly traced around the openings with a pencil, and used those lines to guide my inking. I inked the top portion of the rectangle with Faded Jeans Distress ink. For the grass, I cut another scrap of bristol with one of Lawn Fawn's "Stitched Hillside Borders" dies. I inked that with Mowed Lawn Distress ink, and adhered it behind the filmstrip die cut, so just a bit peeked up from the bottom. I then glued that to my "sky" piece, and trimmed off the excess paper. I stamped the squirrels, pumpkin, knife, & scoop onto some Strathmore Vellum Bristol paper, using Memento Tuxedo Black ink. I colored them with my Prismacolor colored pencils. After I die cut my images, I glued them to my filmstrip background. I had to tuck the squirrels' tails under the filmstrip, so they would fit in their spaces. I do think that adds to the scene, though! Once I had them in place, I burnished the filmstrip to the background piece, to make it stick permanently. For the moon, I die cut a circle from Canson XL Mixed Media paper, using a We R Memory Keepers "Nesting Circles" die. I inked that with Scattered Straw Distress ink. I then splattered some Perfect Pearls solution onto the moon, let that sit for a couple of seconds, and blotted the water up with a dry cloth. That gave me the look of "craters," and added interest to the moon. 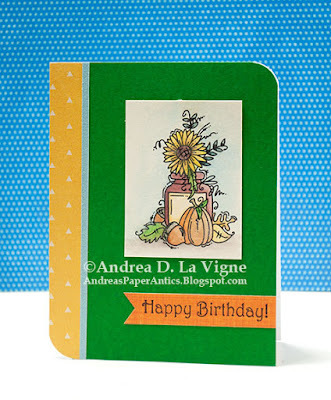 I stamped my greeting, also from "Pick of the Patch," with Delicata Black Shimmer ink. Once that dried, I glued the bottom portion of my moon behind the filmstrip. To give my background panel a bit of depth, I inked a piece of navy cardstock with Chipped Sapphire Distress ink. While I was inking, I laid my image/moon panel on the background. That served as a guide, so I could keep from inking around where the moon would be. I just wanted a hint of a "glow" there. After I finished inking the background panel, I adhered it to a white A2 size card base. I then glued my focal panel to that, and this simple card was done! I really love how this card came out, especially since the finished product was just like the concept I had in mind when I started! 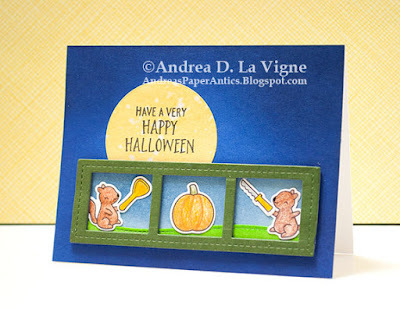 Die Cut Divas: "Autumn & Halloween"
I have a little different post today. 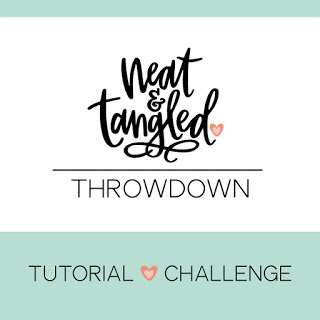 Neat & Tangled is having a tutorial challenge. I don't do video tutorials, so I'm doing a photo tutorial instead. So, grab a cup of your favorite beverage, and let's get going! I actually made 2 cards, one feminine and one more masculine. I figured, I had everything out, so I might as well take just a few extra minutes to make a second card. I used Neat & Tangled's "Awesome" die set, which cuts out both the word and the shadow. I also used the coordinating "Awesome" stamp set to complete my greeting. I began by choosing a sketch from Splitcoaststampers as the basis for my design. Next, I picked out my patterned papers. For the masculine version, I chose one from Echo Park's "That's My Boy" 6x6" pad. I used a pattern from Echo Park's "Anything Goes" 6x6" pad for the feminine version. I cut each paper first to A2 size, then cut the left strip to 2-3/4 wide. I took the remaining piece, flipped it 180 degrees, and trimmed it to 1-3/8" wide, basically taking 1/8" off the left side. This gave me the gap I wanted, while still keeping the pattern continuous. To keep me straight on which panel went which way, I drew a small arrow on the back of each, so I would be sure the patterns matched up. 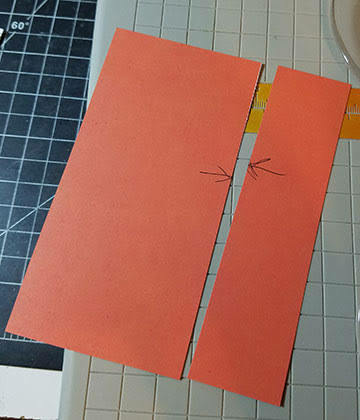 For the strip on the masculine version, I simply cut a 3/8" strip from the leftover patterned paper, and flipped it over to the orange on the reverse side. No better way to coordinate papers than to use from the same collection! I couldn't do that with the diamond pattern, though, so I just used a green cardstock scrap from my stash. 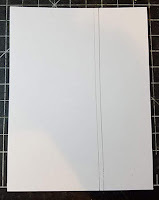 To help me place my strip in the right place on my card base, I first placed the left patterned panel on the front of the base, and traced along the right edge with a pencil. I used my grid ruler and drew another line 1/8" to the left of that. I then adhered my strip along that line. After that, I just adhered my patterned paper panels in place. I die cut a heart, with a Nellie's Choice "Straight Heart" die, from a scrap of pink cardstock, for my feminine version. 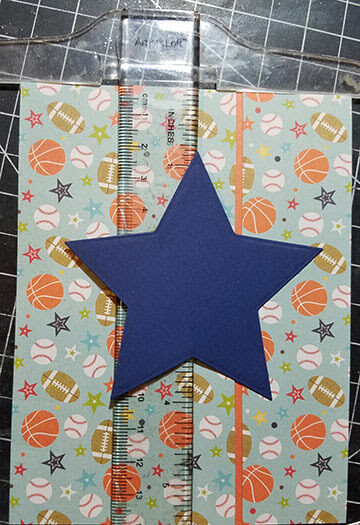 For the masculine, I die cut a star, using a Lifestyle Crafts "Nesting Stars" die. 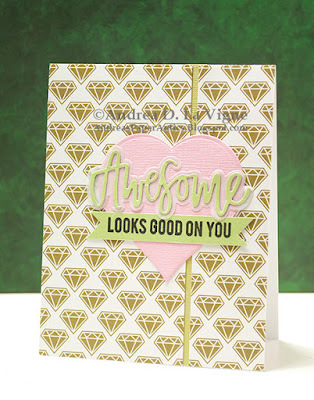 I also die cut the "Awesome" from green cardstock for the feminine and from brown for the masculine. I used Essentials by Ellen 40 lb. vellum for the shadow. 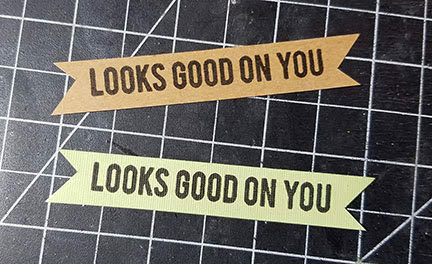 For the stamped greeting, I cut a 1/2" wide strip from the same cardstocks I'd used for the die cut word. I stamped the greeting with Versafine Onyx Black ink, and trimmed the ends of each strip to make a funky banner. After I ran the word die cuts through my Xyron Sticker Maker, I adhered them to the vellum shadow. To keep the die cut heart & star straight, I made a small pencil mark where I wanted the middle of each shape to go. I lined up my T-square ruler with that mark, lightly adhered the shape partly on the card & partly on the ruler with my ATG, then just pulled the ruler out from under it. I then adhered my greeting banner to each card. Finally, I used a little Perfect Paper Adhesive liquid glue to glue down the die cut word. These cards came together fairly easily, in under an hour for both! I didn't copy the card exactly. I looked at it before making my version, but used the card only for inspiration. I die cut the numbers using Lawn Fawn's "Quinn's 123's" from a scrap of patterned paper from Pink Paislee's "Birthday Bash" 6x6" pad. I stamped the numbers onto the die cuts with the matching stamps in Versafine Onyx Black ink. Finally, I ran them through my Xyron Sticker Maker, to apply adhesive to the back. 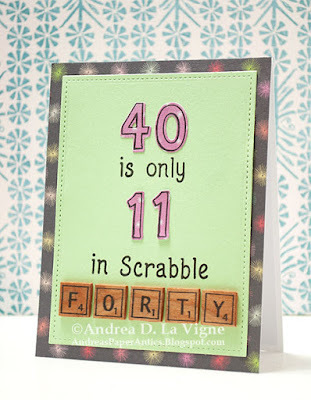 I stamped the Scrabble-looking letters using the "Game Tile Letters" set from Simon Says Stamp. I used Versafine ink again, since I was using real cherry wood veneer paper to stamp on. I thought this ink would bleed less than a water-based dye ink. I was right on that point, but I hadn't realized it wouldn't dry! I tried heat-setting it, but it still lifted when I (carefully) pressed my finger against it. So I finally took the paper outside and sprayed it with a matte fixative, which solved the problem. I let the paper sit for a few hours, as per the instructions on the spray, then cut the letters out with my scissors. I glued them to a piece of brown craft foam, and put them under acrylic blocks until the glue dried. 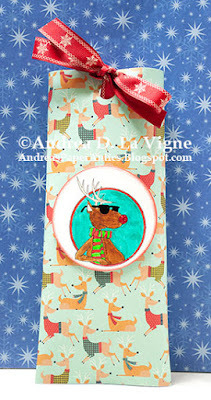 For the background, I used the largest of Lawn Fawn's "Small Stitched Rectangle" dies to cut a panel of mint cardstock. I matted that with another pattern from "Birthday Bash," that I'd cut to A2 size. 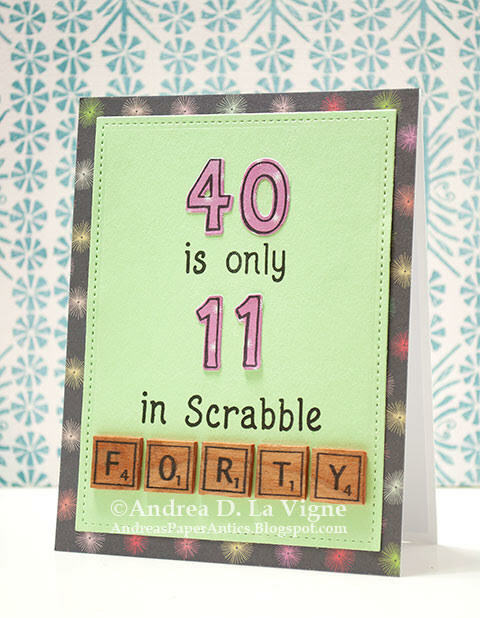 I lightly adhered my "40" to the mint panel, just to judge where to stamp my first line of letters. I determined it would look best to have about 1/2" from the top of my mint panel to the tops of the numbers, and the same distance from the bottom of the panel to the bottom of my tiles. I used my MISTI to help me position & stamp the letters from Lawn Fawn's "Claire's ABC's" set in Versafine ink directly onto my panel. After the ink had dried, I permanently adhered the "40" & "11" centered side-to-side on the panel in their respective spots. Finally, I used small pieces of Scor Tape to adhere my game tile letters, and this card was done! I considered adding sequins or something, but decided in the end just to leave it as is. Dies R Us Challenge #105: "What's Your Number?" I found a tutorial on Splitcoaststampers.com (actually through video suggestions on my YouTube account) on doing a "Pop-up Book Card." 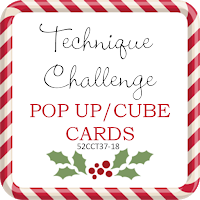 I've done pop-up and box cards before, but this particular fold technique was a new one for me. Thankfully, the tutorial was very easy to follow! The main tutorial was for a 6x6" card, but they gave alternate measurements at the end for an A2 card. Since postage--in the U.S. at least--is higher for square cards, I went for the A2 size. I began by cutting my card base for each card, as well as the inside patterned paper panel. I did have to search through quite of a bit of my stash of holiday patterned papers to find any that were large AND sturdy enough. Thankfully, I found this ornament paper, though I don't know who made it. I did all my cutting & scoring for the card base & the patterned paper insert, and glued them together, as per the instructions. Once I'd finished that part, I decided to turn my attention to the card front. I found another green diamond patterned paper from the same paper collection, and cut it slightly smaller than A2 size. I also die cut a label using a Spellbinders "Labels Eight" die. I adhered the label to the background, and placed it in my MISTI stamp positioning tool. I used my grid sheet to help me center the base layer from Hero Arts' "Color Layering Cardinal" stamp set. I stamped that first in Memento Tangelo ink, then stamped again with Memento Lady Bug ink. I repeated this for the second card, just lining up that card front with the first one. I stamped the second layer of the cardinal with Memento Rhubarb Stalk ink, and the third layer with Memento London Fog. Finally, I used Memento Tuxedo Black to stamp the face detail. I stamped the feet with Tangelo, adding a little Memento Potter's Clay for shading around the tops of the legs. I stamped the branch from the same set with Memento Rich Cocoa ink, after masking off the tail & feet on the bird. The branch ended up covering the feet anyway, though. At this point, I was definitely NOT starting over! So I stamped the 2 pine sprigs from the set in Memento Northern Pine ink, die cut them, and glued them along the branch, covering the bird's feet. Hopefully, it helps more than hinders the design! 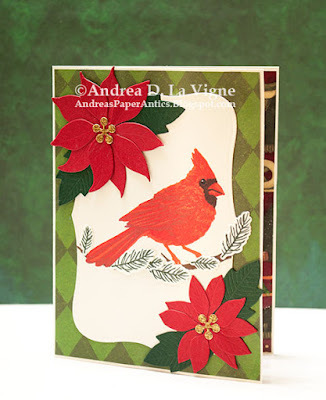 I die cut the poinsettia flowers & leaves using dies from Memory Box's "Blooming Poinsettia" set. I glued them in place on the card front, using the 2 larger flower parts in the upper corner, & the 2 smaller ones in the lower. Finally, I added the centers that I'd die cut from gold glitter cardstock. For the inside panels, I wanted to use another, smaller "Labels Eight" die. But I didn't have one that was large enough for my greeting, and still small enough to fit where it needed to go. So I took one that was just barely too big for the space, traced around the inside on the same cream cardstock I'd used for the card base & front label, and cut those out with scissors. This gave me a slightly smaller label than if I'd die cut. Thankfully, the shape was pretty easy to cut by hand, and I only had to do 4 for both cards! I stamped the greeting, from Hero Arts' "Very Merry Christmas" (apparently discontinued), onto the top of one label with Northern Pine ink. I left the space below blank for us to sign the card. 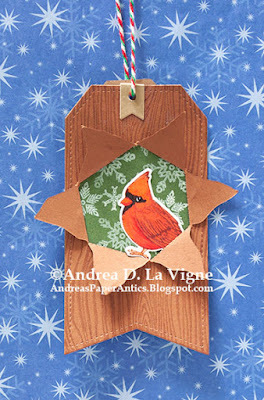 To decorate the other label, I stamped the cardinal, 2 pine branches, & pine cones from Hero Arts' "Vintage Christmas Post"; & the 2 smaller branches from "Color Layering Cardinal." I used Tombow markers to color the pine branch stamps, especially on the larger one so I could easily make the branch brown & the needles green. I stamped the branches & pine cones with Rich Cocoa ink, and the bird in Tuxedo Black. I colored the cardinal with my Prismacolor colored pencils. After die cutting everything with the coordinating dies, I arranged all the elements onto the label, and used liquid glue to adhere everything in place. After the glue set up, I trimmed off the overhanging bits, following the edge of the label. Finally, I glued each label in place on their respective panels, and both cards were done! a2z Scrapbooking August Challenge: "Anything Goes"
Incy Wincy Designs Challenge: "Winter in August"
Pile It On #145: "New Technique and/or Oldest Stash"
My fifth & final card for My Favorite Things' "Summer School 2018 Session 2." The lesson for Day 2 was Visual Triangle. I've had this fox tag from the Echo Park "The Story of Fall" ephemera pack for at least a few years now, and hadn't used it yet. I have some of the ephemera pieces from that collection in a baggie, designated for card making. So I decided this would be the perfect time to use this tag! I did punch a hole through the top and added some brown hemp twine, but otherwise, kept the tag in its original state. I first cut a piece of grey cardstock to 4x5.25". I taped it to the back of My Favorite Things' "Small Brick Wall" stencil, and applied Ranger Texture Paste over the stencil. When I had a fairly even coating of paste, I carefully removed the stencil, cleaned it & my palette knife, and set the panel aside to dry. After the paste had dried thoroughly, I taped the stencil back over the pattern. I inked the bricks with Rusty Hinge, Fired Brick, & Vintage Photo Distress inks. I also went over parts with Antique Linen Distress Oxide ink, just to try and give a bit of lighter distressing, but I don't think it really had any effect in the end. When I finished inking, I removed the stencil. I adhered my tag on to my panel with liquid glue. I wanted to make sure it would adhere to the textured surface, and I figured a generous coat of glue would do the trick. Of course, that meant weighting it down under some acrylic blocks for a few hours to dry, but that was no big deal. For the greeting, I used a My Favorite Things' "Happy Hellos" die (discontinued). I cut it out of a scrap of green cardstock. I know there is no green in the tag or the background, but I felt a pop of it would help spice up the overall red-orange/neutral color palette a bit. I used liquid glue to adhere the letters to the tag. To create my visual triangle, I chose 3 wood veneer leaves from my stash, and green & brown buttons. I used glue dots to adhere the buttons, and Ranger Multi Medium Matte to glue down the leaves. After the glue on the leaves had set up a bit so they wouldn't fall off, I pierced holes through the buttons into the background panel with my paper piercer, and stitched through the buttonholes with cream embroidery floss. I used small pieces of Scor Tape to adhere the floss ends to the back side of the panel. Because my panel was so bumpy now, I decided to use Scor Tape to adhere it to a red mat, rather than my ATG gun, which might have messed up some of the elements on the front of the panel. I matted my panel, and adhered the whole thing to a white A2 card base. Now it's time to get the rest of the ephemera bits & pieces used up! My Favorite Things' "Summer School 2018 Session 2" began with a lesson on monochromatic cards. I created this card as my homework, to send to Send a Smile 4 Kids, to encourage a hospitalized child. 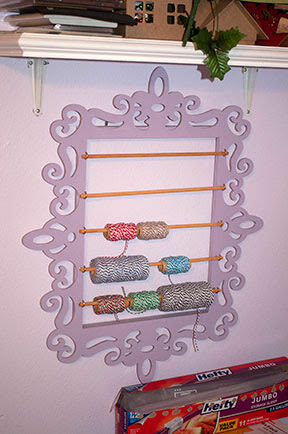 I chose the "Mini Chicken Wire" stencil from My Favorite Things (apparently discontinued) for my background. I wanted to do the background in 3 sections, each inked a different shade of yellow. (I chose yellow to go with the bee theme.) After trimming my panel of Canson XL Mixed Media paper to A2 size, I first used the circle die from MFT's "Blueprints 13" (discontinued) to die cut 3 circles from my panel. Then I die cut it into sections with a "Stitched Basic Edges 2" die, also from MFT. I taped the top section of my die cut panel to the back of the stencil, and inked it with Squeezed Lemonade Distress ink. Before removing that section, I lined up the middle section with the first, and taped that in place on the back of the stencil. I wanted the stenciled design to be continuous down the whole card, but still have the shades of yellow sharply defined, so I had to line the panels up this way. Before I inked the second piece with Mustard Seed Distress ink, I removed the top section. Finally, I lined up the bottom piece, removed the middle, and inked with Fossilized Amber Distress ink. I had to adjust the stencil a bit, since it does not cover a full 5.5", but it wasn't too hard to line it up so I could extend the design down the rest of the section. After I adhered the 3 sections to a white A2 card base, I glued the upper & lower circles I had previously die cut into place, doing a bit of die cut inlay. 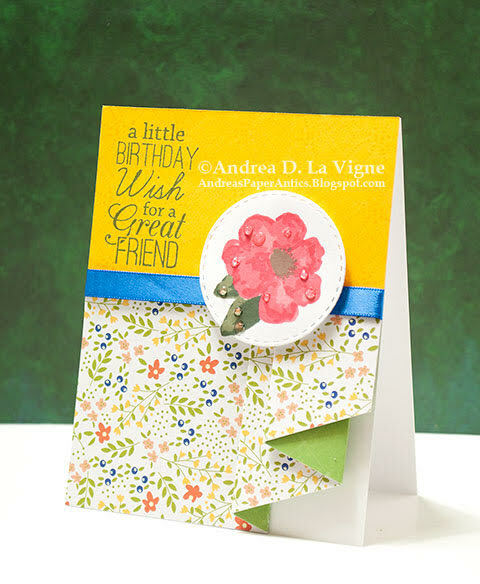 Using my MISTI, I stamped the greeting, from Simon Says Stamp's "Circle Friends" set, in the bottom circle, and the bee from the same set in the top. I also used my MISTI to stamp the honeycomb circle from "Circle Friends" on the remaining die cut circle. I used Simon Says Stamp's Sunshine ink for that, since it seemed a good match with the Fossilized Amber. I actually had to die cut a new circle and re-stamp, because my stamp was not clean the first time, and I got a bit of black ink mixed in with the yellow on the paper. At least it was easy to line everything up the second time! When I had the circle stamped, I glued it into place on the card front. I stamped the bee again onto a scrap of mixed media paper, and also onto a scrap of Essentials by Ellen 40 lb. vellum. I colored the paper one in with colored pencils, and fussy cut just the body. I fussy cut the wings on the vellum piece, also cutting a section across the body to connect them. 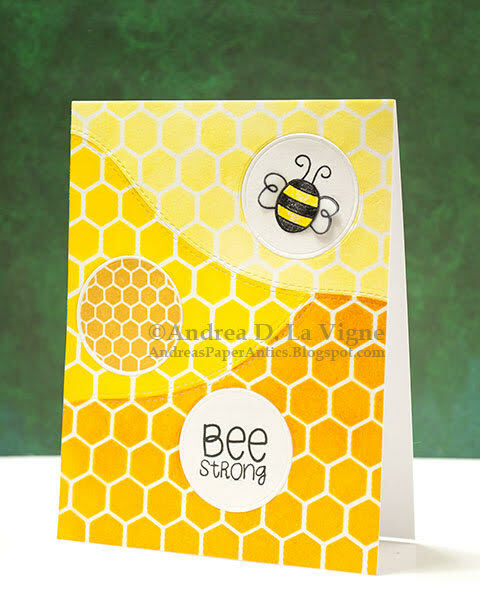 I used a glue dot to adhere just the center part of the wings piece over the stamped bee on the card front, leaving the wings themselves loose. Then I glued the body part down with liquid glue, basically sandwiching the wings in between that and the card front. The only reason I'd stamped the bee in place on the card front, was to have the antennae without having to try and fussy cut around them. I just figured it would be easier to paper piece. I don't know how effective the vellum wings are, but I think they do add at least a little something in real life. 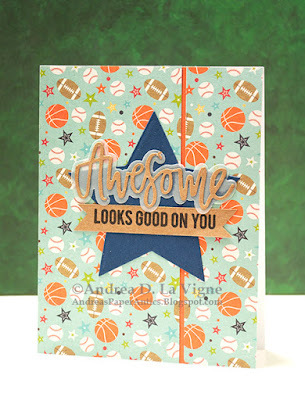 Live Love Cards August Challenge: "Monochrome Cards"
a2z Scrapbooking's August Challenge: "Anything Goes"
This is my "homework" for the final day of My Favorite Things' "Summer School 2018 Session 2." The lesson that day was on ombre (a gradient effect using values of only one color). I first cut a piece of Canson XL Mixed Media paper to 4.25x5.5". I stamped the "Romantic Script Background" from My Favorite Things onto that with Versamark ink, and heat embossed with Recollections Clear Detail embossing powder. I used Tattered Rose Distress ink to add color to the panel, adding more color at the bottom & letting it fade out to almost white at the top. It admittedly was kind of difficult to get a satisfactory color depth at the bottom of the panel, since this is such a light ink, but I'm happy with how it turned out. Once I'd finished inking, I buffed the panel with a dry paper towel, to get any residual ink off the embossed areas. I die cut a doily from Essentials by Ellen 40 lb. vellum, with a Prima "Victorian Lace" die. I also die cut a butterfly from more mixed media paper, with a "Flutter of Butterflies - Solid" die. For the butterfly, I wet the whole die cut with clean water, and painted on to the middle part some Tattered Rose ink that I'd smooshed onto an acrylic block. That wasn't quite dark enough for the butterfly to show up against the background, though, so I added a little watered-down Vintage Photo Distress ink over the Tattered Rose. That gave me the subtle contrast I wanted. I put a glue dot on the back of just the center of my doily, and adhered it to my background panel. I used a couple more glue dots to adhere my butterfly over the doily. I'd die cut the coordinating body for the butterfly from some coppery shimmer cardstock, and used liquid glue to attach that. 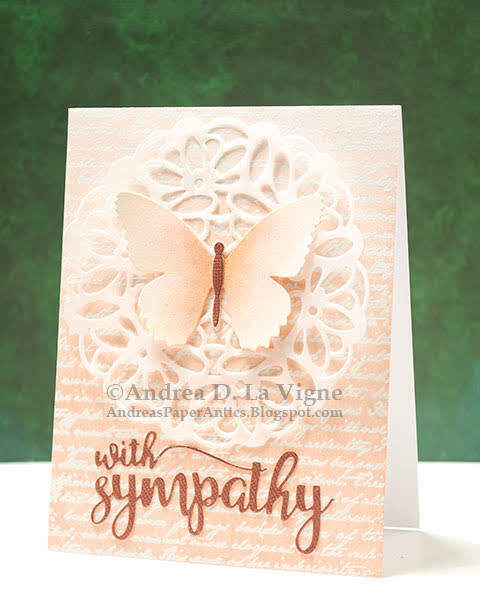 I die cut my greeting using Avery Elle's "With Sympathy" set, from some more shimmer cardstock. I used liquid glue to add that to my panel. I made sure to glue the "with" so it looks like the end of the "h" goes right into the cross of the "t" in sympathy. Finally, I mounted my panel to a white A2 card base. Live Love Cards: "Monochromatic Cards"
Day 4 of My Favorite Things' "Summer School 2018 Session 2" is all about rainbows. 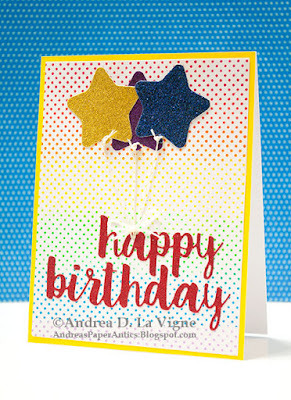 I used their "Itsy Bitsy Polka Dot Background" stamp and rainbow inking for my card background. I placed the stamp in my MISTI to begin. I applied a bit of removable adhesive to the back of my white 4x5.25" panel, placed it face down on the stamp (which was on the door of the MISTI), & closed the bottom of the MISTI over it. The adhesive stuck my panel to the base, ensuring it would stay in that position while I stamped. I could have placed it in the corner of the MISTI, but there would have been a gap at least along the bottom & left side of the panel, due to the way the stamp is. I inked up the top portion of my stamp with Memento Love Letter dye ink, daubed the bottom edge of the inked section with a dry cloth to soften it, and stamped onto my panel. I cleaned my stamp, inked below where I'd already stamped with Memento Morocco ink, daubed the top & bottom edges to give a blended look, and stamped again. I repeated this process, working my way down the stamp, with Hero Arts Lemon Yellow, Delta Emerald Green, Memento Bahama Blue, & Hero Arts Orchid inks. The Morocco I chose for my orange was a bit too dark in the end, and looks much like the red. Something like Memento Tangelo probably would have been better. Oh well--live & learn! For my greeting, I used My Favorite Things' "Cause for Celebration" die set. I die cut the happy & birthday words from red glitter cardstock that I had backed with Stick It adhesive. I also die cut 3 star balloons from purple, gold, & blue cardstocks using Lawn Fawn's "Party Balloons" die set. I knew my balloons would go at the top of my card, so I wanted to bring up the yellow, blue, & purple colors that were a bit farther down the card. Likewise, my greeting echoes the red at the top of the card. I glued my balloons in place, leaving the very bottom loose. I tied some sparkly twine around the bottom of each balloon. I adhered my greeting, pierced a hole inside the "a" in happy, and threaded the twine from my balloons through the hole. I pulled them kind of tight (without bowing my panel), & secured them on the back with a little Scor Tape. I tied a bow from the same twine I'd used for the balloon strings, and glued it over the strings right at the top of the "a," to make it look like they are tied around that letter. Then I adhered my panel to a piece of yellow cardstock cut to A2 size, and mounted that to a white card base to finish. This card was a bit hard to design, but I really like the way it came out in the end! 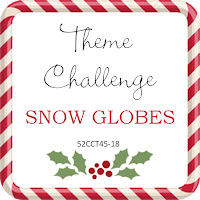 The current theme for Aud Sentiments' challenge blog is "Anything Goes + A Sentiment." I created this card to send to Send a Smile 4 Kids. They are currently accepting cards for hospitalized kids with fall, winter, and holiday (Halloween, Thanksgiving, Christmas, etc.) themes. For my design, I used Sketch #SC576 from Splitcoaststampers.com. I sized the "Autumn Jar" digital image from Bugaboo Stamps in Photoshop, then printed it onto a piece of 140 lb. watercolor paper. I then colored it with my Inktense pencils, using a damp paintbrush to pick up the color from the pencils and apply it to the paper. After I finished coloring the image, I added a shadow underneath with the Neutral Grey Inktense pencil, and a very light "halo" around the upper portion with Iris Blue. Then I set that aside to dry. 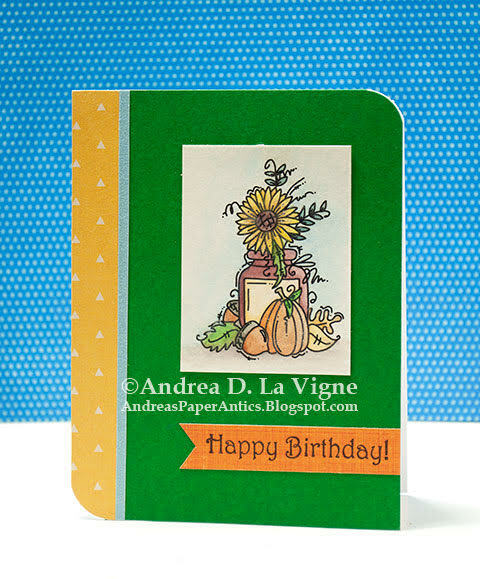 For the greeting, I used one from Sweet 'n Sassy Stamps' "Happy Birthdays" stamp set (apparently discontinued). I stamped it in Versafine Onyx Black ink onto a scrap of orange paper with a slight pattern to it. I then cut that into a banner. I used an A2-size piece of green cardstock for my background. After I adhered it to a white card base, I added a strip of yellow patterned paper from my scrap stash to the left side, and a 1/8" wide strip of light blue glitter paper next to that. Finally, I adhered my focal panel and greeting banner. As one more touch, I added some sparkle to the sunflower, pumpkin, small leaves, and the tips of the larger leaves with my clear Spectrum Noir Sparkle Pen. I rounded the top right and bottom left corners with the 1/2" side of my We R Memory Keepers Corner Chomper, and that finished this card. I'm also entering this card in 613 Avenue Create's "Anything Goes" Challenge #212 (not playing the twist). My Favorite Things Summer School Session 2 is in full swing this week. Day 2's lesson was on Focal Point. I created this pleated skirt card for a friend who has a birthday coming up. I first created the pleated skirt portion, following the instructions in this tutorial at Splitcoaststampers.com. I didn't have any double-sided patterned paper that was suitable, so I cut a piece of floral paper & another piece of green that had a subtle check pattern (both from my scrap stash). I pretty much coated the back of the floral pattern with ATG adhesive, and adhered the green paper. That way, when I did my folds, the green paper peeks through from behind the floral one. For the top of my card, I cut a piece of yellow cardstock so that it would cover the portion above the "skirt," but not extend below it. I stamped it with the "Delightfully Delicate Background" stamp from Sweet 'n Sassy Stamps (apparently discontinued), using Hero Arts Butter Bar ink. It is very subtle tone-on-tone, but gives a bit of interest. I also stamped my greeting, from My Favorite Things "Birthday Greetings" set, in Memento Northern Pine ink. For my focal point, I used a flower from My Favorite Things "Watercolor Flowers" stamp set (discontinued). I stamped the base layer with Lawn Fawn Wild Rose ink, the middle with Memento Lady Bug, and the top layer with Memento Love Letter ink. I stamped the center & the base of the leaves with Memento Olive Grove, and the second layer for the leaves with Northern Pine. To make the leaves look like they were under the flower, I stamped the base flower layer onto a full-sticky Post It note, and cut out just the portion where I wanted the leaves to go. I masked off my flower with that, and then stamped the leaves. Finally, I cut that piece with a "Stitched Circles" die from Simon Says Stamp. I did a bit of "outside the box" die cutting, since the leaves stuck out a little too much for that die. I fussy cut around the larger leaf, slipped the die under that, cutting side down, and ran it through my die cutting machine. That way, the leaf was not cut with the die. I adhered the "skirt" portion to a white A2 card base, and adhered the yellow panel above it. I had to lift the top of the skirt piece up a bit, to tuck the yellow underneath. Then, I added a piece of blue satin ribbon as a "waistband," to cover the seam. I used Scor Tape to add a piece of fun foam to the back of my floral circle, so that it wouldn't get distorted when I adhered it over the ribbon & pleats. Finally, I used more Scor Tape to adhere that to my card. I added some Morning Dew Nuvo Crystal Drops to the flower & leaves, for "dewdrops," and this card was done! 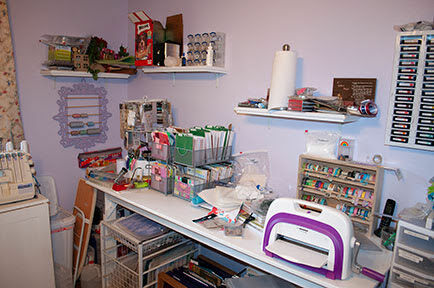 Even with all the cards I've posted over the past few years, I don't think I've ever posted photos of my craft room. Christina Thomas at Creations with Christina has started a feature on her blog called Make~Motivate~Connect. Each week, she will have a different prompt, and encourage people to link up a photo of their project in response to that prompt at her site. This week's prompt is craft room photos, so that inspired this post. Our craft room actually is my brother's old bedroom. He got married & moved out 7 years ago, leaving an empty room. 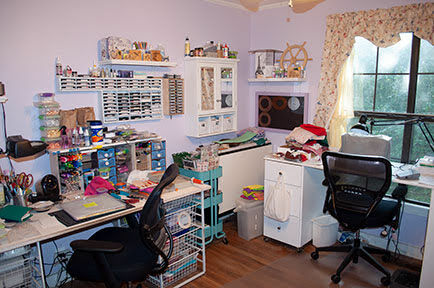 What else would you do with an empty room than make it into a craft room? ;) My mom & I repainted the room a lovely lavender shade, with cream on the trim & ceiling. We also pulled up the carpet. 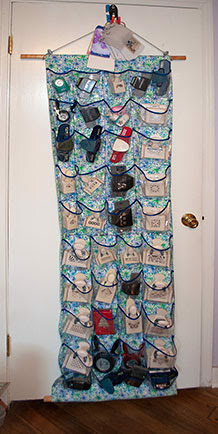 Since we also use it as a sewing room & to cut out sewing projects, we didn't want any pins or needles hiding in carpet. We expected to have to lay wood flooring, but were pleasantly surprised to find the hardwood flooring that is in our halls continued into that room! So all we had to do--after pulling numerous carpet staples from the wood--was sand & seal the flooring. I think that was MUCH easier than installing new flooring! I built most of the furniture myself. My scrap desk actually came about after reading an article in an old scrapbooking magazine. (I think it was a Scrapbooks, Etc. special organization issue.) It was about creating a desk for under $100. I don't know if I spent less than $100, but I got a good desk that has stood the test of time for me! I got 2 wire drawer units (I think they've been discontinued since) & a 4x8' sheet of melamine from Lowe's. I knew how big I needed my desk top, so I had a guy at the store cut the melamine into 3 pieces: 1 to fit the desk, and 2 other smaller pieces that I could fit in the back of our van for other projects. I edged the top by gluing on white ribbon, to cover the raw wood. Then it was just a case of laying the melamine on top of the drawer units. 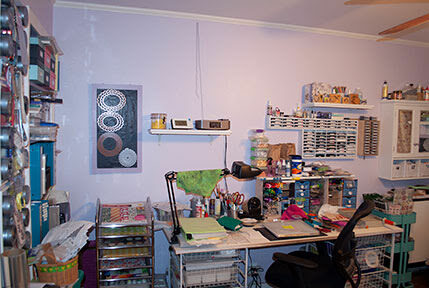 I had made this long before we had this craft room, when I did my scrapbooking & card making in a different part of the house. But it fit perfectly in this new space as well! Because the room is maybe 10x10' at most, we've had to make the most of vertical space. I created shelf space with a small melamine shelf laid across some small stackable drawer units & 2 marker storage units from Stamp-n-Storage at the back of my scrap desk. I also built an ink pad storage unit to fit perfectly in the space between the top of that shelf & the bottom of another shelf we'd hung on the wall above my desk. I made 2 magnetic boards to hold my larger wafer-thin dies, that are just plywood pieces with magnetic sheets glued on, framed with 1x2 boards that I painted a darker lavender color. We had a medicine cabinet that I'd "had" to get for a bathroom renovation we did in our house. It had turned out not to fit in that space, so we hung it in the craft room instead. 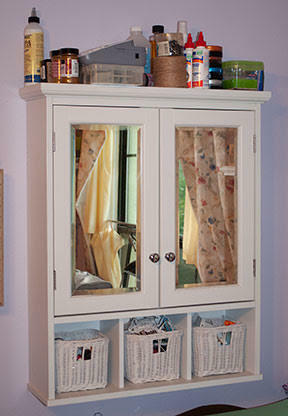 The cupboard part stores mostly acrylic craft paints, stains, & painting mediums. The baskets underneath (what made me fall in love with the piece in the first place) hold various odds & ends, and I utilize the top to store items I don't use often. Opposite my scrap desk is an additional craft table that I built out of melamine for the top & 2x4 lumber for the legs & frame under the top. I keep my washi tape holder (also from Stamp-n-Storage); die cutting machine; and 2 small wire drawer units (from Bed Bath & Beyond) to store paper scraps, 6x6" & smaller paper pads, & some stamps & dies on this table. I also have a lazy Susan style unit with 2 hanging racks by Recollections that I got some years ago, just to store small things. 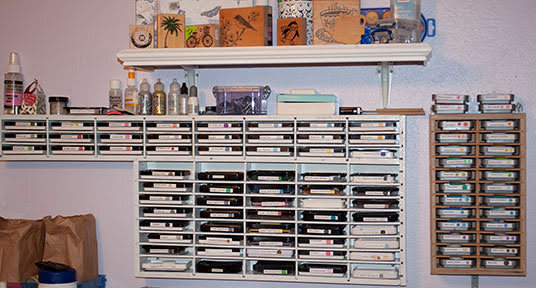 Above that, I have another ink pad storage unit I built for my full-size Distress inks, & a few shelves for paper towels & more odds and ends. I also have another wire drawer unit underneath, and a file cube I built to store large paper scraps in 12x12" file folders; plus a rolling file cart with more 12x12" paper in folders on it. On the wall at the end of the table, I have a rack that I built for my larger rolls of bakers twine, following instructions I read on someone's blog a few years ago. 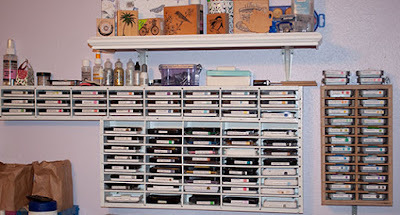 I keep most of my stamp sets in 2 Fridge Binz on a small shelving unit in the closet. (I totally got this system from Jennifer McGuire.) I made dividers from green cardstock, using my We R Memory Keepers 1-2-3 Punch Board to create file tabs on the top edge of each. I laminated these, trimmed around the perimeter, and printed labels for the different categories with my label maker. On the shelf underneath that, I keep my 8.5x11" cardstock. I have several magazine holders turned on their backs, and slip my cardstock (sorted roughly in rainbow order in job ticket holders) into those. Most of my cardstocks are "off-brand," so I don't bother labeling those. 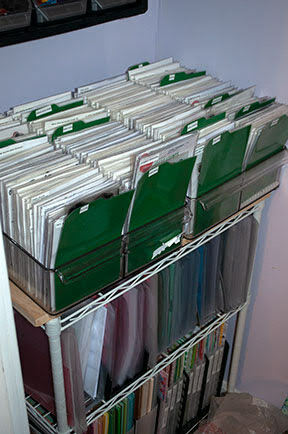 I keep 12x12" colored cardstock & patterned paper in Cropper Hopper holders on the bottom shelf. I hope you have enjoyed this tour, and maybe gotten a few ideas for your own crafty space! The theme for the Lawn Fawnatics Challenge #33 is "Fun Folds." 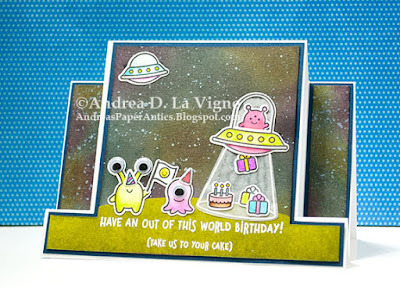 I used a center-step card template from Hot off the Press to create the base for my birthday card. This card by Laura Sterckx inspired my background. I liked how she masked the bottom of her focal area to create a "planet" area. 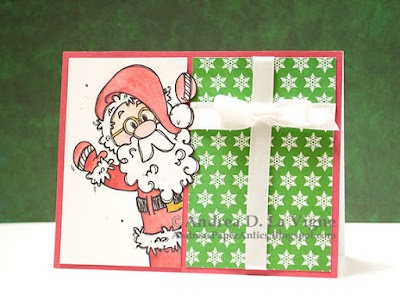 I used Simon Says Stamp's "A2 Curved Edge" die to cut a mask for my card front from masking paper. I wasn't thinking, though, so I didn't leave enough above the curve to mask off the sky when I inked the ground. So I stuck 2 full-sticky Post It notes together, so they covered the width of my panel, and traced the curve from the masking paper onto that. I then cut it with my scissors to create my "sky" mask--problem solved! I applied the "ground" mask to my panel, and inked the sky area with Peacock Feathers, Picked Raspberry, & Wild Honey Distress inks. I applied the colors just kind of randomly, not going for any specific pattern. After I finished that, I applied Black Soot Distress ink over the whole sky, until the colors underneath just barely showed through. I diluted white acrylic craft paint with a bit of water, & used a small paintbrush to splatter my panel with that to create stars. After the sky portion dried, I lined my sticky-note mask up with the curve of the lower mask, removed the ground mask, and inked the bottom of the panel with Crushed Olive Distress ink, followed by Peeled Paint. I heat embossed my greeting, from Lawn Fawn's "Beam Me Up" stamp set (which I also used for my images) in white embossing powder, then set the panel aside. I stamped several images in Versafine Onyx Black ink onto scraps of Strathmore Smooth Bristol paper. I used my Tombow markers to color them in, adding shading with a damp paintbrush to most of the images. For the "beam" piece, I stamped onto vellum with Versamark ink, & heat embossed with Ranger Super Fine Detail White embossing powder. I die cut all the images with the coordinating dies. To adhere my images, I used mostly liquid glue. I did run my beam piece through my Xyron Sticker Maker, to apply a solid coat of adhesive to the back, so I didn't have to mess with hiding my adhesive. I stuck that down first, making sure there was enough room for the spaceship to go above it. To create a slight "glass" look to the top of the larger spaceship, I used its die to cut a scrap of vellum. I glued that behind the top of the spaceship, hiding my adhesive behind the ship & its alien pilot. I then glued down the rest of my images. I adhered the cake & presents last, making it look like they were being "beamed up" into the spaceship. I also added googly eyes to the 2 larger aliens. I didn't want my background panel to be matted just with the white card base. So I cut a slightly larger piece of navy cardstock, and adhered the watercolor paper panel to that. For the side panels, I decided to continue the galaxy background look. I repeated the process I'd used for the sky on those. I matted them with navy as well, and adhered them to the card base to finish my card. It did end up taking me a few hours to make this card, but I think a lot of that was figuring out how to cut the main panel, since I deviated from the template. I still think it was worth it in the end, though! Simon Says Stamp Wednesday Challenge: "Make Your Own Background"
Send a Smile 4 Kids is celebrating their 175th challenge at their blog! Their theme is "Christmas in July 4 Kids." I made this cute card using mostly Lawn Fawn products to send to them for this year's holiday season. I stamped the 3 birds from "Winter Sparrows" onto a scrap of Strathmore Smooth Bristol paper with Versafine Onyx Black ink. I used the same ink to stamp one of the speech bubbles from "A Birdie Told Me" onto a scrap of white cardstock. 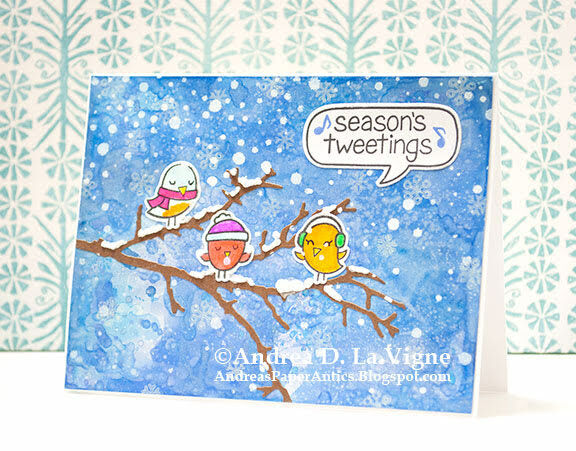 I stamped the greeting from "Winter Sparrows" inside the speech bubble, using my MISTI stamp positioner to help me get it straight. I die cut the speech bubble with its coordinating die. Finally, I stamped the music note from "Winter Sparrows" with Blueprint Sketch Distress Oxide ink. Once the ink on my birdies had dried, I colored them with Tombow markers, pulling in a Zig Clean Color Real Brush marker for the yellow on the blue bird's belly. I let the ink dry for a few minutes, then die cut them with the coordinating dies. The biggest part of this card was the background. I wanted to try a technique Tim Holtz had developed for use with Distress Oxide inks. (I had actually learned about this from Jennifer McGuire.) I cut a piece of glossy cardstock to 4-1/8x5-3/8" for my panel. I smooshed Blueprint Sketch, Faded Jeans, & Salty Ocean Oxide inks onto my Tonic Easy Clean non-stick mat, and spritzed them with water. I dipped my cardstock (glossy side down) into the ink, & swooshed and pounced it until I had covered the surface. I dried it with my heat tool, and repeated this process a couple more times until I had the look I wanted. I let the ink dry for several minutes, then came time for the magic. I applied a thin coat of Distress Micro Glaze over the inked surface. The Distress Oxide inks on their own leave a dull, kind of chalky finish. But, on glossy cardstock, when you apply the Micro Glaze, the colors just come to life--bright & bold! After I had applied an even coat, I buffed any excess off with a paper towel. I used the 2 snowflake stamps from Lawn Fawn's "Winter Penguin" set to stamp several flakes on the background with StazOn Cotton White ink. This ink is specially formulated for non-porous surfaces, like glossy cardstock. I was kind of disappointed, though, that the snowflakes didn't show up much in the end. To start building my scene, I die cut a branch from brown cardstock using the "Bare Branch" die from Impression Obsession. I glued it to the background with liquid glue, and trimmed off a couple of bits that were hanging over the edge of the panel. I glued my birds in place, and glued the speech bubble down. I also added some "snow" on the branches, with a Marvy Snow marker. The too-subtle look of the stamped snowflakes still bothered me, though. So I got my "Falling Snow" stencil (from Simon Says Stamp) and taped it over my panel. I used a foam make-up applicator to pounce white acrylic paint through the stencil. I made sure it also went over the birds & branch, so it looks like they are in the snowfall, not just surrounded by it. After I removed & cleaned my stencil, I took a black fine-tip marker and went over the eyes on two of the birds that had gotten covered up by paint, just so they didn't look like they only had one eye. 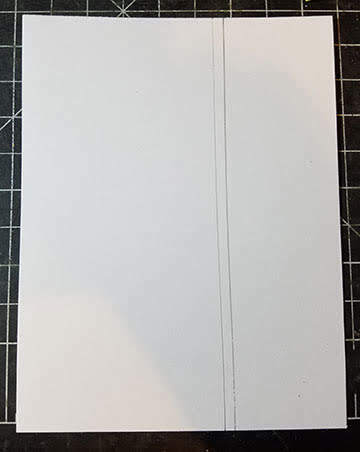 Finally, I adhered my panel to a white A2 card base, leaving a 1/16" mat on all sides.